Six people practice yoga on the field of Al Lang Stadium on Thursday, Sept. 13, 2018. The Tampa Bay Rowdies will have check-ins for the yoga class at Gate 5 of Al Lang Stadium starting at 3:30 p.m. Saturday. 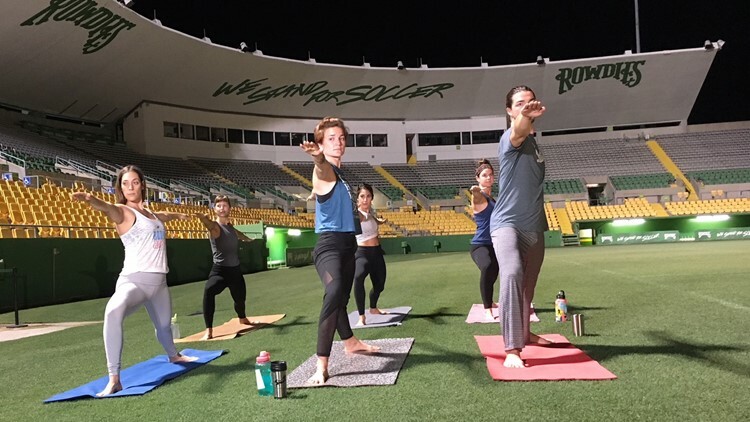 The class starts at 4 p.m.
ST. PETERSBURG, Fla. – The Tampa Bay Rowdies, and The Body Electric Yoga Company, are set to host their annual “Yoga on the Pitch” this weekend at Al Lang Stadium. The team will have check-ins for the yoga class at Gate 5 starting at 3:30 p.m. Saturday. The class starts at 4 p.m.
You must sign up in advance for this event. Participants will receive a seat at Saturday night’s game. Yogis are asked to bring a mat and water. It costs $22.50 for adults and $12 for kids. Use the promo code "YOGA," when buying tickets. Instructors from Body Electric will lead the class. Kickoff between the Rowdies and the Atlanta United Football Club Second Team is set for 7:30 p.m Saturday.